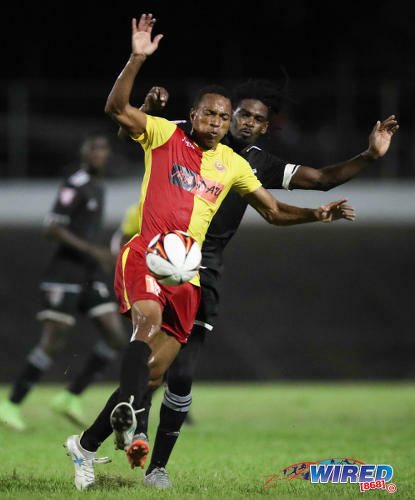 North East Stars wrapped up their second Pro League title at the Ato Boldon Stadium in Couva last night with a game to spare, edging Police FC 1-0 thanks to a late second-half goal by utility player Keston George. 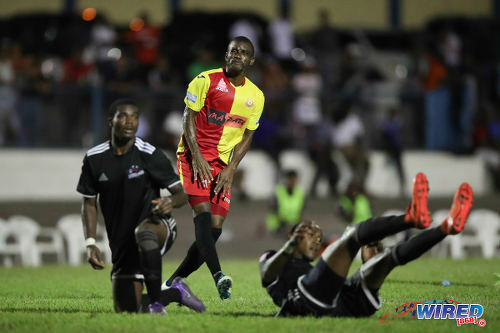 George, incidentally, was a Pro League champion with Central FC last season but—in one of the domestic top flight’s bleakest years yet in economic terms—switched camps in mid-season to join the revolution at Stars in Arima. 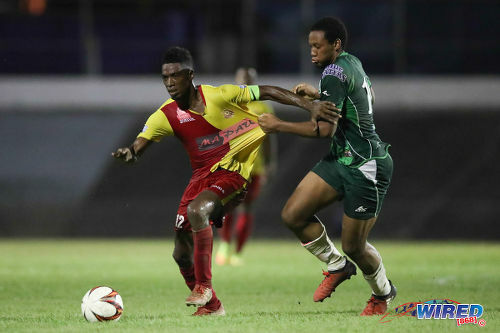 Photo: North East Stars captain Elton John (left) tries to escape from W Connection midfielder Briel Thomas during TT Pro League action at the Arima Velodrome on 27 October 2017. Even more notably, the 37-year-old Derek King, an Arima resident and former Arima North Secondary football captain, became only the second coach to lift the Pro League trophy at different clubs. 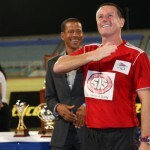 And while former England World Cup player Terry Fenwick was first to that honour—having won at San Juan Jabloteh and Central—King was the only coach to spend the entire season with the respective title winners, as Fenwick had replaced Serbian Zoran Vranes at the helm of Central with just six weeks left in their league campaign. 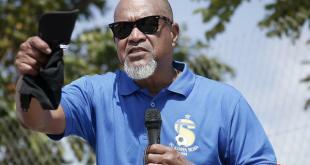 It was quite a return to club football for King, who has not coached in the Pro League since Joe Public withdrew in 2011 after a FIFA ban on team owner and ex-CONCACAF president Jack Warner. The Pro League’s loss had been the Soca Warriors’ gain, though, as King was part of the coaching staff that steered Trinidad and Tobago back to the CONCACAF Gold Cup in 2013—after a six-year absence. As assistant to coach Stephen Hart, King helped Trinidad and Tobago to successive Gold Cup quarterfinal places and a FIFA ranking of 49th in the world. 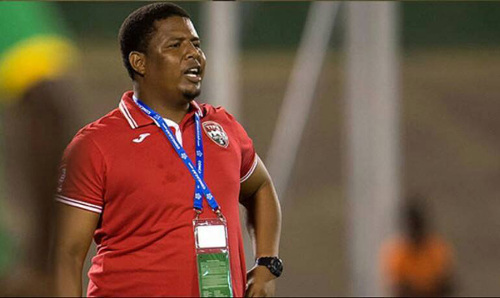 And, during his only stint as a national head coach, the former international defender led T&T to the 2014 Under-20 Caribbean Championship title, which remains the last men’s trophy won by the Trinidad and Tobago Football Association (TTFA). Photo: Former Trinidad and Tobago National Under-20 coach Derek King. Wired868: How do you feel about the 2017 Pro League season and helping North East Stars to their first League title in 13 years? King: It was a great achievement and what makes it more important than my first one at Joe Public is we know the financial issues in the Pro League right now. So credit to [owner] Darryl Mahabir who has been there supporting us and who bought into what we brought to North East Stars. It is a joy to come back into the League after so many years and win [it]. It is great and I still haven’t gotten over it. I only noticed last night that about 80 percent of the players in this team have never won a Pro League title, like Densill Theobald, Kevon Goddard, Yohance Marshall. So it is a great achievement for the North East family and the people who support us too because we are an Arima-based team and we get that support from the Arima community. I personally would like to congratulate the Mayor [Lisa Morris-Julian] who supported us and was there with us all the way. I won the title when I was 29 years [at Joe Public] and now I am 37. So I am in the books twice as the the youngest coach to win the Pro League and the second youngest to win it. I still consider myself a young coach and I’m just trying to get better every day. Photo: North East Stars flanker Kishun Seecharan (right) curls a shot around Central FC defenders Taryk Sampson (left) and Rhondel Gibson during Pro League action at the Arima Velodrome on Friday 8 September 2017. 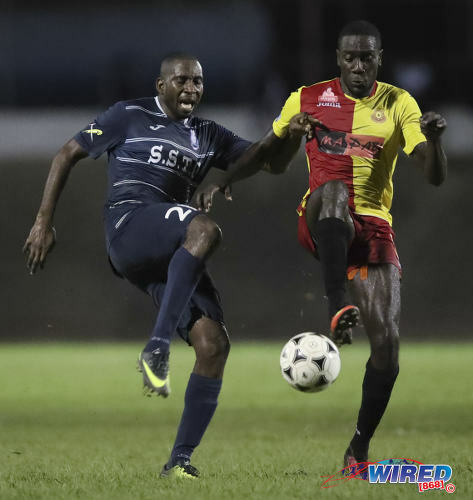 Wired868: Your next match is at the Arima Velodrome on Tuesday—Stars host San Juan Jabloteh from 6pm. Is there anything special planned? King: Well, on Tuesday, we are opening the gates for the Arima people so they can come and watch us play and see the trophy free of charge because we are really thankful for the support we have had from them. North East is a community-based team and we have been bringing out that support every game. The people from the community are always so excited about seeing us play and we haven’t lost a game at the Velodrome for the season. We have some guys who didn’t play much and we want to give them a game but also [Rundell] Winchester is two goals behind the League’s top scorer [W Connection’s Neil Benjamin Jr] and we want to give him a chance to finish on top. We want to keep our unbeaten home record too. We hope next year we get more sponsors and business people involved. 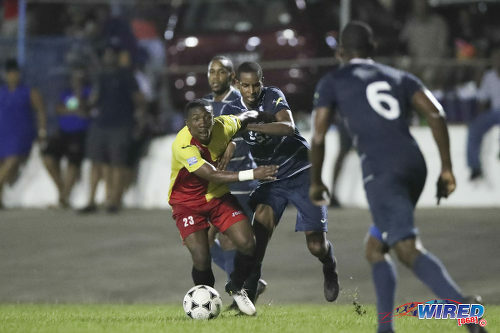 Photo: North East Stars forward Rundell Winchester (right) challenges Police FC midfielder Todd Ryan during Pro League action at the Arima Velodrome on 28 July 2017. Wired868: What was it like returning to the domestic league after spending the last five years concentrating on international football? King: Well, club football is day in and day out while, in international football, you spend your time looking at games and then have to get your team ready in five days. I really enjoyed coming out every day with these guys and getting them ready and motivated to play on the weekend. We built something special with this squad and we had a family—even more than the Joe Public team. I think the issues with the finances and stuff brought us closer together. Sometimes we didn’t get paid on time but our owner would come to the guys and tell them when they would get their money. Right now, he doesn’t owe any player or staff member and with him coming to the players and being honest helped us to stay together. Also, I think the leadership quality of players like Densill and Yohance and our captain Elton John was a big asset. We had a good core of experienced players around youth players like Goddard, [Duane] Muckette, [Jomoul] Francois and [Kishun] Seecharan who worked with me before. Kerry Baptiste did a tremendous job for us too. He was in and out of a few clubs for the past two seasons but I knew what he could do for us and he pulled us out in some important games. Wired868: Were there any other challenges this year you would like to touch on? King: I think the stop/start scheduling [of the Pro League] definitely impacts on players. I have a good relationship with [Pro League secretary] Julia [Baptiste] and I know they had problems because so many venues did not have lights and that caused the problem. But it is better when we have a schedule we can run with. When you are training and don’t know when next you will be playing, it is harder to motivate your players. Sometimes the breaks between games are as long as two and three weeks. We started playing friendly games [against school and club teams] during the week to keep the guys going and keep up our match fitness and that helped us for our final few games. At the end of the day, players want to play. I think the presentation for us when we were handed our Pro League trophy could have been much better too—in terms of signage or a backdrop behind us and so on… I was shocked that the [Trinidad and Tobago] football president [David John-Williams] was in the stands and never came down to offer us congratulations, knowing that this is the flagship league for the national football team. [John-Williams] should have been there with the CEO of the Pro League to hand us our trophy and congratulate us. So I found that was a little distasteful. Photo: North East Stars captain Elton John (left) scores a penalty kick during Pro League action against Police FC at the Arima Velodrome on 28 July 2017. North East Stars won 3-2. Wired868: Do you feel you should still be an international coach? What is your ambition as coach? King: Coaching a national team is not on my mind right now. What is for me is for me. I am always willing to serve on the national level because I think I have something special in coaching that can help. When you watch the players who were on my last youth team [like] Shannon Gomez—who I helped to get a contract in New York—Aikim Andrews and Levi Garcia, they are doing quite well. I will never turn my back on a national team but that depends on the bosses. My dream personally is to coach the National Senior Team. I don’t know when that time will come but I am working on achieving that. Right now I am gaining that experience and when they call upon me I will be there anytime to serve my country. 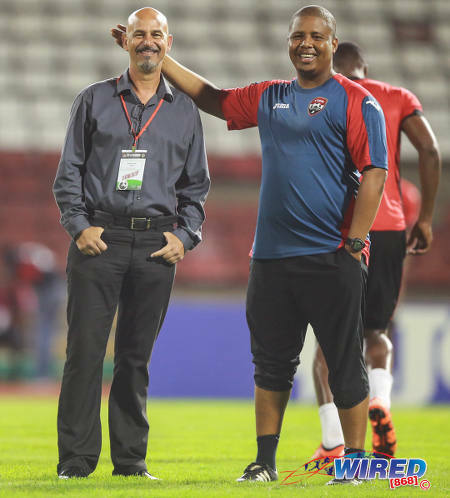 Photo: Former Trinidad and Tobago National Senior Team coach Stephen Hart (left) enjoys a light moment with assistant coach Derek King before kick-off against Nicaragua on13 October 2015 in Port of Spain. Wired868: You were initially taken to North East Stars by Terry Fenwick as part of his take-over plans which obviously didn’t pan out. What can you tell us about the club’s boardroom issues and their impact on the club? King: Fenwick and I were together there for just a month and a half and it was he who picked the team at first. But then there were issues and eventually there were some guys [Fenwick brought] who didn’t stay because of financial issues and then I had to bring my own players on board like Akil Clarke and Julius James and so on. In the end, I brought about 80 percent of the players who finished the season with us. All I can say is I think Darryl [Mahabir] has someone coming in as a co-owner for the next season. Most likely, it looks like that person will be Ryan Nunes who came in late in this season and supported us financially over the past few months. Next season, we have the CFU and CONCACAF competitions and I think [Mahabir] is bringing people who can help us financially to be ready for that. 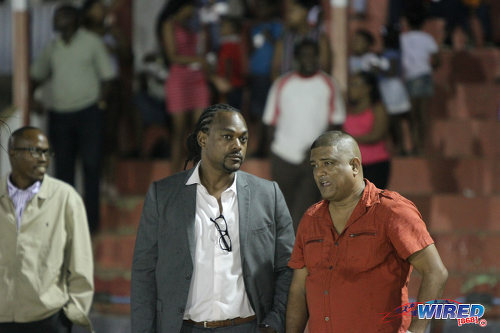 Photo: Former Sport Minister and Central FC managing director Brent Sancho (centre) watches WPL action in Sangre Grande with North East Stars owner Darryl Mahabir. Wired868: Do you have a pick for Most Valuable Player? King: (Laughs) It is tough to pick one person because we had some outstanding performers this season—we had Yohance [Marshall] and Densill [Theobald] in particular. I think, personally, I would give it to Densill knowing that people talk about him as an old man but his attitude was always right towards training and games. He is one of the fittest players in the squad and his discipline and leadership qualities are examples for everyone to follow. […] But I have to say all the players were brilliant, especially my captain Elton [John]. We also have guys like Akeem “Froggy” Garcia, Jameel Neptune and Keston George who, to me, are knocking on the door for national selection. I am not begging for a pick but I hope they get the opportunity to show what they can do. Photo: North East Stars midfielder Densill Theobald (left) holds off Central FC attacker Jason Marcano during Pro League action at the Arima Velodrome on Friday 8 September 2017. Wired868: Do you have any closing words? 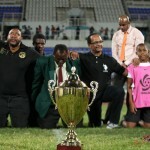 King: I just want to thank Darryl Mahabir, Ryan Nunes, the Mayor [Lisa Morris-Julian] especially, David Williams—who is the manager of the stadium and cooperated with us to make sure we always had everything on spot—Kevin Jeffrey, who was my team manager and assistant coach, Trevor [Nottingham], the goalkeeper coach, Selwyn “Lloydie” Gabriel, the equipment manager, and God who made this possible for us to come out and build something. And we hope 2018 will be an even better year. Photo: North East Stars winger Akeem “Froggy” Garcia (left) tries to hold off a Police FC opponent during Pro League action at the Arima Velodrome on 28 July 2017. 1—Errol McFarlane (Defence Force), Michael McComie (Joe Public), James McLean (North East Stars), Ricky Hill (San Juan Jabloteh). ..I have been saying for years that the so-called “pro” league is an unsustainable joke. TTPL men cuss me. Now look. We need a National League that includes all financial arrangements that clubs consider adequate to their circumstances. No joke.. In other words the present model of the TT Pro league is a failed one, and we want to keep our jobs and teams so bad, that we won’t invite change, but rather drag football down with us as we fail. 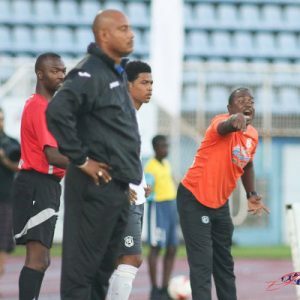 http://newsday.co.tt/2018/02/23/jabloteh-coach-says-semi-pro-approach-needed/. 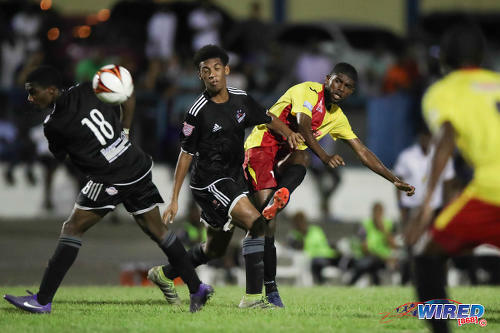 IT MAY be tough times ahead for local football, as clubs within the TT Pro League struggle to deal with the economic state of affairs in the country. Coach of San Juan Jabloteh, Keith Jeffrey, suggested the players in the Pro League may have to seek additional means of income. Great questions? Add to it is the league a business? Are the clubs businesses? Daiz de damn ting self. Yuh doh hear no kinda mention of this. How come we eh hearing from Skeene these days? Is this just lip service? Is this 15-20 years too late? Nah man, you cyar be serious! Personally I think Skeene is a honorable fellah. So I’m not surprised that he is not drawing a salary. Skeene’s downside is he hasn’t been able to make the thing work after these years. And the Pro League has an abysmal record of helping players. But there has never been talk of dodgy accounting or anything like that at board level. With the wages reduced listen to the new plan. Government money can now pay the players’ salary, and sponsorship money can pay the owners. Hydrotech for example will pump money, but since salaries are so low, what will that money now be used for? 3000 x 20 players = 60,000 = subvention … in other words there biggest challenge is now met with no effort, planning, even breathing. Ah hearing about reducing wages, but nothing about generating revenue. ..That is what I have been saying for YEARS. Is not rocket science..
How hard and regular will players train for the minimum wage, at that salary (if you can call it that), Take into consideration nutrition, a good pair of boots to play, train, etc. They would be broke in the 2nd week. This is greatly increase minor league football playing. ..The information is that some men were playing in 2017 pro league for free, so.. ..So what is the difference between TTPL and TTSL? How can TTFA allow this travesty to continue? 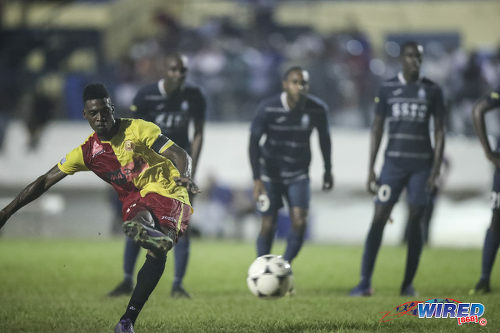 It is all about the votes in the TTFA General Meeting, the CFU Club Championship places, and the Holy Grail of the CONCACAF Champions League money.. ..In a semi-pro league bro. Not in a “pro” league..
Keith Look Loy they keep calling it a pro league but it hasn’t been for quite a while. Until the clubs become companies and run their football like a business. There will be none until real business procedures are adopted. The NBA hired a businessman as next commissioner, not a former player, for a reason. It’s a tough situation for the PL clubs. Unlike the government they can’t just throw money down the drain. They’ve got to find ways to balance their books. With little to no real guaranteed revenue sources they obviously need to control player salaries to sustainable levels. Heck, even if a club wins the league they are not guaranteed getting paid. How can a club survive in such an uncertain environment? What I would suggest, however, is if you’re going to scale back player salaries it would be prudent to implement incentives at the back end, such as sharing of all winnings with the players. Crazy bro. So basically the only ones benefitting from the league are the players. Owners are essentially pouring money down the drain. That’s not sustainable. Carlos when you have sponsors, govt subvention and can move a player or two a year, you might make something. I think the latter is what most clubs are banking on. That’s why we see players being sold to remote places around the world. Players benefitting? That’s one way to look at it. One has to get the big picture to understand who is benefitting when the government subventions, outside sponsorships to league and individual teams, as well as, administrative salaries are transparent and open to scrutiny. Good point. The owners and management must be benefitting as well as not many of the PL clubs are closing shop:-) Not as yet anyway. Ask them what is their business plan, one owner after all these years was on here, and his club is not registered properly. When you say close down, what exactly di they close down? A business? Or a club? There is a distinctive difference. “Pro League champion club North East Stars were thrown into turmoil after more than 80 percent of its players and staff could not agree with the direction the club is heading under the new management team being led by businessman Ryan Nunes and Michael Awai, the former FUTGOF manager. Yesterday, coach Derek King confirmed his exit from the team after venting his disgust in the team’s decision to implement a basic wage deal of between $2500 to $3000 monthly salary payment for all players. The management also decided that the team should field an under-21 team for the 2018/19 pro league season. Brian Jordan the sad thing is they don’t even realize this fact. As disheartening as it is, at least dey upfront about it, and it gives the players an opportunity to find other clubs. But me eh understand how Awai could say dat $2,500-$3,000 TTD is a decent amount. Out of curiosity what is a sustainable wage rate a Pro League club can pay its players? This is the second time notth east benefitted from poor Referee assistants against Police FC. In round one in Arima Velodrome, after Police equalized the Referee gave the goal but the assistant waived, the Referee disallowed the goal thinking it was offside only to be told after that he saw a foul. In last nights game Police scored first, the assistant was slow to get there so he missed when the goal keeper pulled it from behind the line. So they won two games that should have ended as drawn all with the help of the Referees and their assistants. Derek could create history and bring some CFU champions league football to the velodrome place go ram out already biggest crowd in the pro league. May need to do some ground maintenance though.